The Treaty of Waitangi between Māori chiefs of New Zealand and the British Crown was first signed on 6 February 1840. 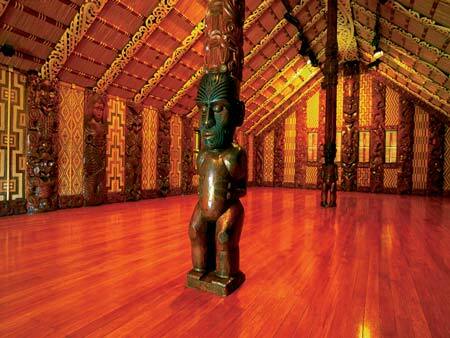 To commemorate the 100th anniversary of the treaty, a meeting house representing all the tribes of New Zealand was built in the grounds of the Treaty House at Waitangi. This photograph shows the rich carvings and woven panels inside the building.